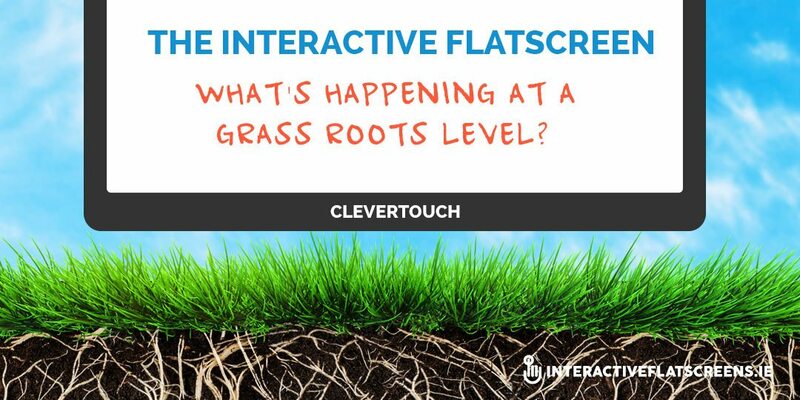 The Interactive Flatscreen - What's Happening At A Grass Roots Level? The Interactive Flatscreen – What’s Happening At A Grass Roots Level? Interactive Flat Screens Have Arrived! The Interactive Flat Screen used to be the future of learning in the classroom. Not anymore. These days it is fast becoming the present. This powerful touch monitor has arrived and is making life easier and more interesting for teachers and pupils in schools across Ireland. Instead of predicting the changes this powerful tool will have in the way children are educated, let’s look at the difference it is making to schools today. Just what is happening at grass roots level? Before the flat screen arrived, interactive white boards were the latest technology and many schools invested in them and still do. But they have proved to be problematic. Visibility is impaired on sunny days so the teacher must draw the curtains. Dust on the board is a persistent problem. Another complaint is that there is poor fluency between the pen and what you want to write. The interactive white board also needs to be recalibrated at least once a day which is time consuming and bothersome. They also require projector lamp replacement and projector maintenance. The interactive flat screen has none of these problems. It is clear. It can be seen by any pupil regardless of where they are seated or what the weather is like. There is no need to calibrate the screen. In addition to this there are no unnecessary cables and there is no need to buy extra speakers. 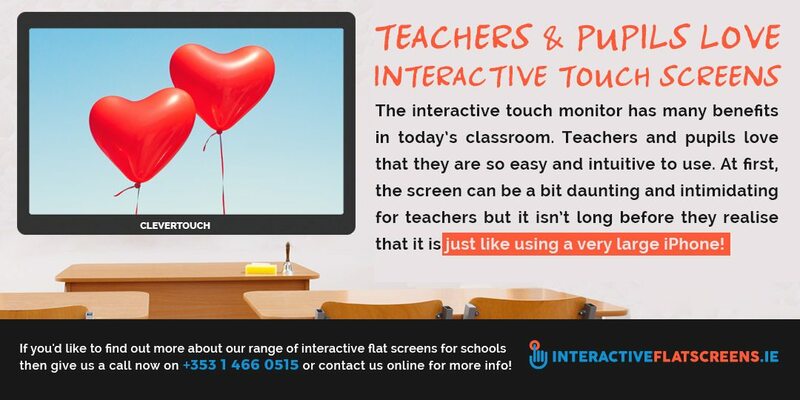 The interactive touch monitor has many benefits in today’s classroom. Teachers and pupils love that they are so easy and intuitive to use. At first, the screen can be a bit daunting and intimidating for teachers but it isn’t long before they realise that it is just like using a very large iPhone. Information can be used and manipulated with ease. You can write, move, copy and change all with the touch of your finger. As children are bringing ICT skills into the classroom it is important educators keep up. They must be versatile, flexible and grow with the pupils and technology. The interactive flat screen empowers both teacher and pupil. They are the ultimate tool for blended learning which is the model approach to education these days – a synthesis of traditional pedagogy and IT based student centred learning. These days, with the arrival of the interactive touch monitor, both teaching and learning is fun. It’s a good time to be a teacher and an even better time to be a pupil. There is nothing to fear from ICT in the classroom. The blended learning approach ensures that the teacher remains in control while the pupils learn. ICT just facilitates education. It is there to serve you and not the other way around. If you’d like to find out more about our range of interactive flat screens for schools then give us a call now on +353 1 466 0515 or contact us online for more info!